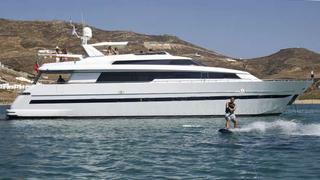 A call to Jordan Waugh at Camper & Nicholsons confirms the sale of the 26.75m Sanlorenzo motor yacht Atsko. She was built by the Italian yard in 2000 to RINA class and Jordan says she's always been owned by the same close-knit family who've kept her in mint condition including a full refit in 2011. Accommodation is for eight guests in four staterooms - two doubles and two twin cabins. All staterooms have full sound systems and en suite facilities while the main saloon has a 42 inch television with surround sound. Forward crew accommodation for four in two twin cabins enables crew to comfortably and discreetly service guests even on extended cruises. Her cruising speed is 21 knots topping out at 25 knots courtesy of twin 1,826hp MTU engines. Atsko was asking €1.1 million with VAT paid.